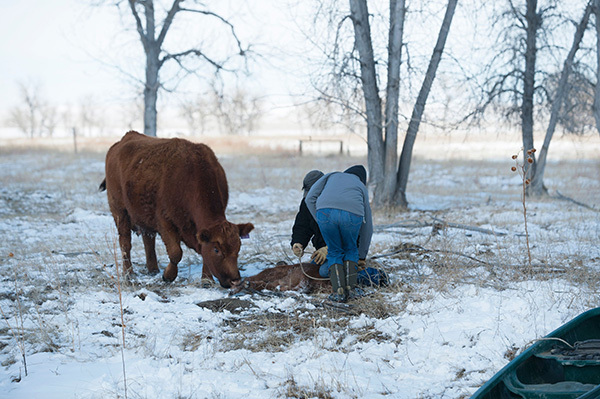 All photos courtesy of Savanna Simmons. 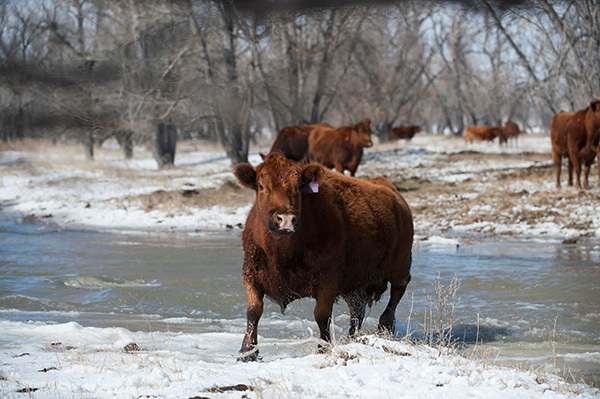 For the past few weeks, areas of the country like Nebraska, Wyoming, and Montana have suffered extreme flooding from rapid snow melts and ice jams along major rivers. 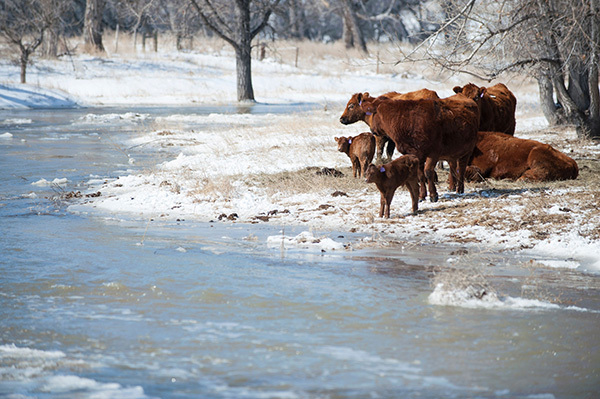 The rising waters have closed highways, threatened homes and businesses, and caused dangerous conditions for residents and their animals. 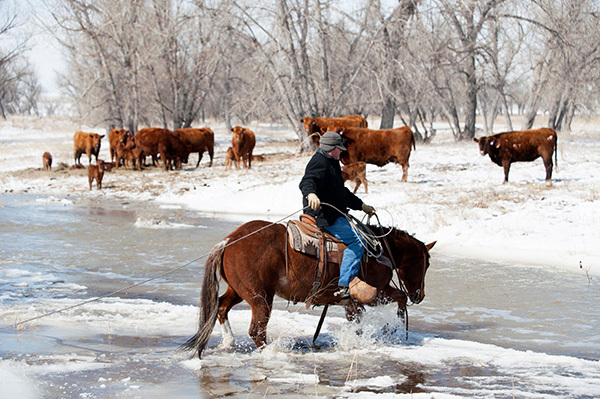 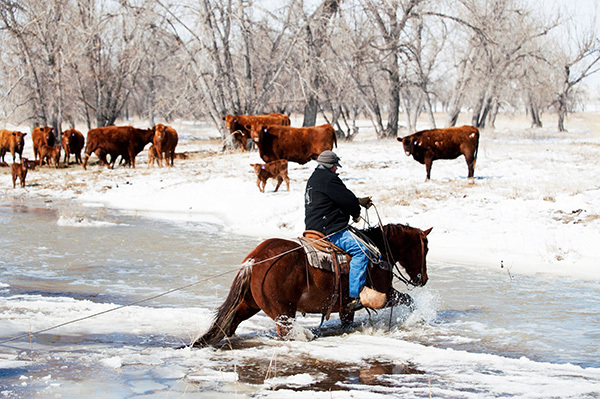 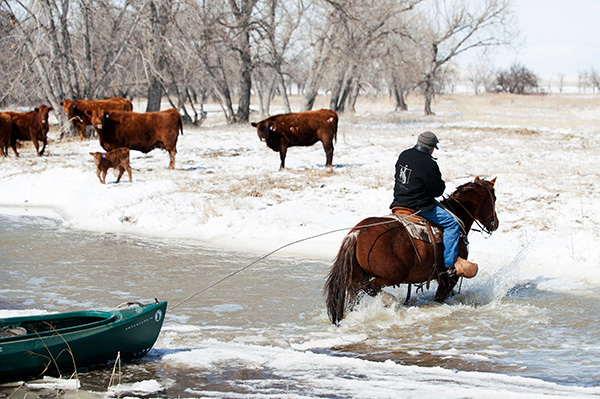 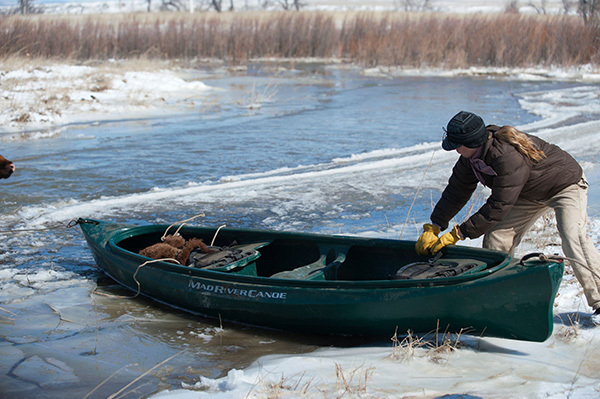 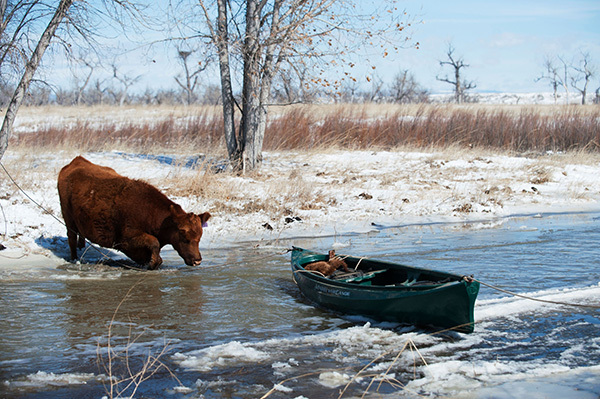 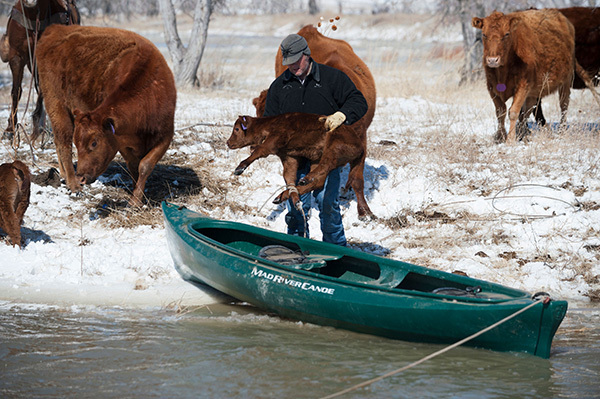 When the Kottwitz family of Mule Creek Junction, Wyoming knew their calves wouldn’t be able to cross the rapidly rising water, they concocted a genius plan to bring them to safety, with the help of a few friends, a Quarter Horse, and a canoe. 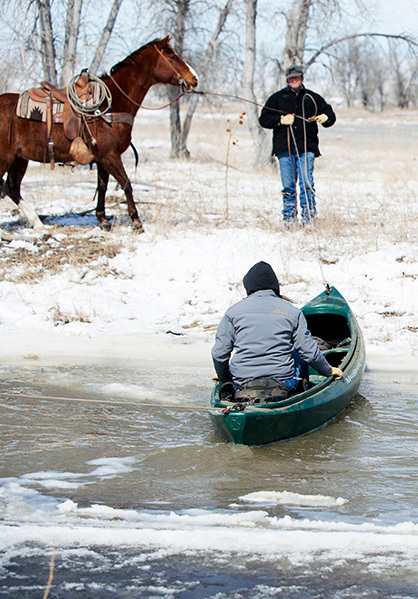 Friend and neighbor, Savanna Simmons, was onsite with her camera to capture the expedition. 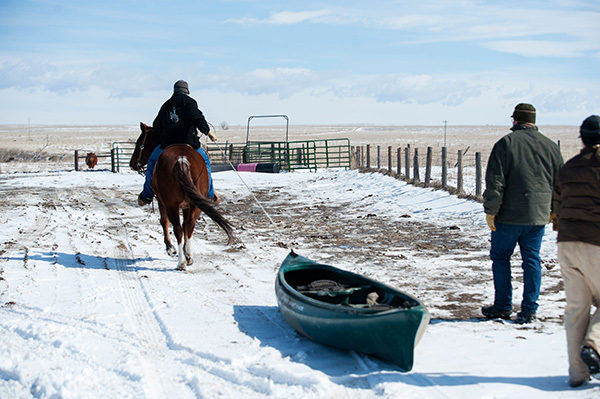 Savanna and her husband, Boe, live with their two sons, Brindle and Roan, on Four Three Ranch just north of Lusk, Wyoming. 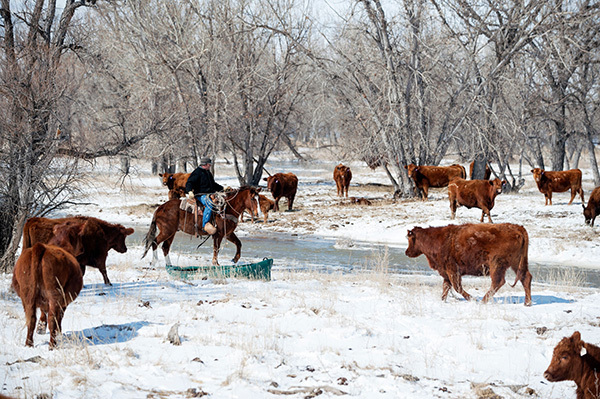 The Kottwitz ranch is located 45 miles north of Lusk in Mule Creek Junction. 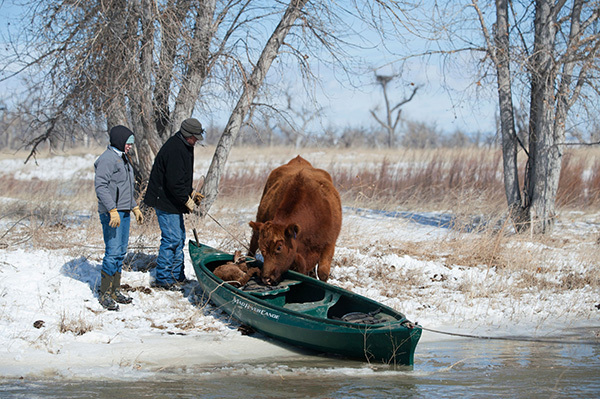 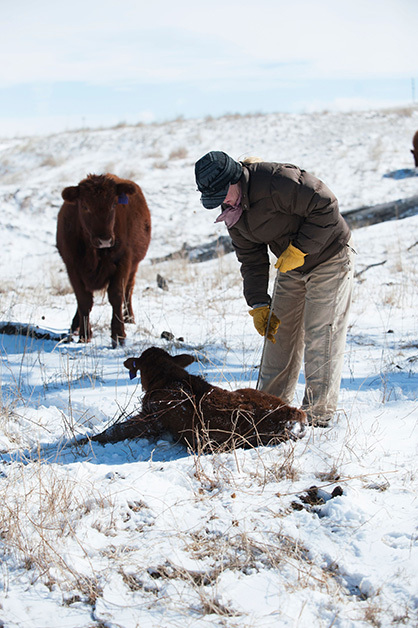 Assisting in the calf rescue were Boe and Jennifer Kottwitz with their daughter, Abby, and Savanna’s husband, Boe. 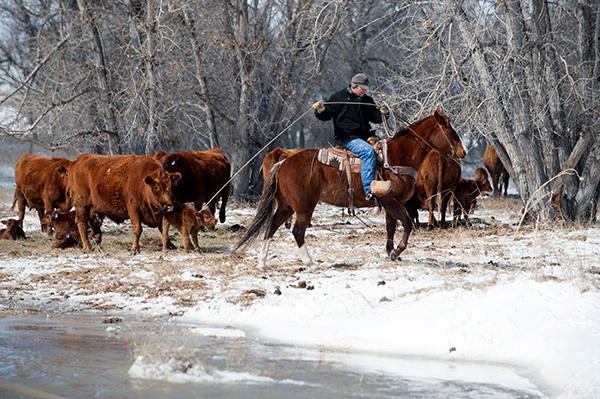 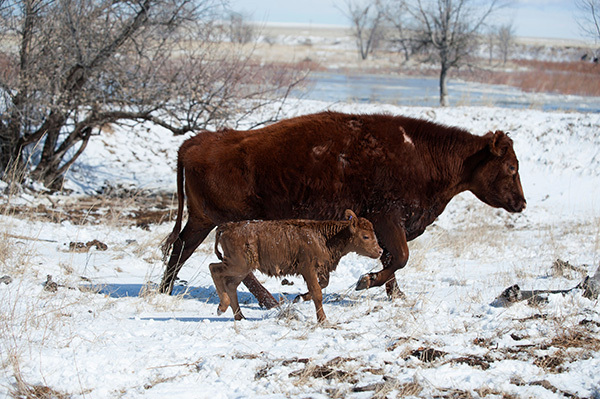 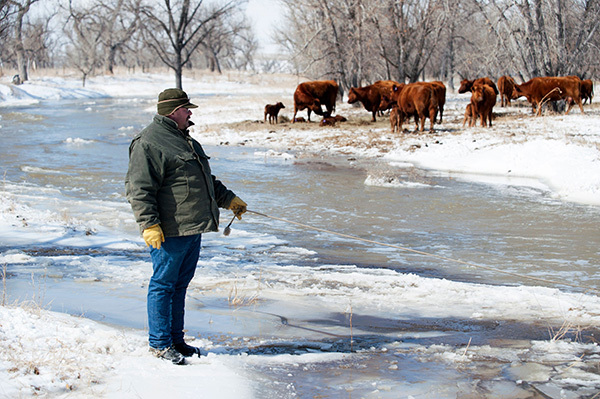 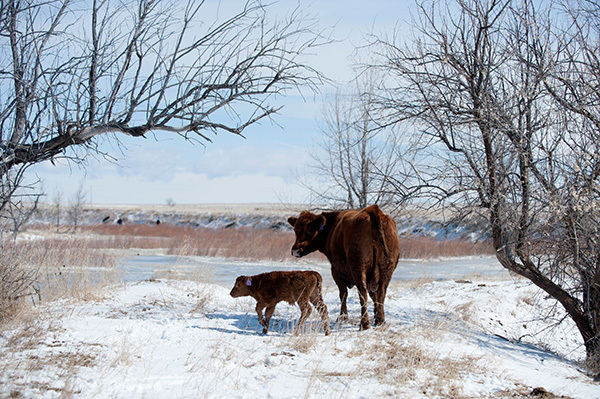 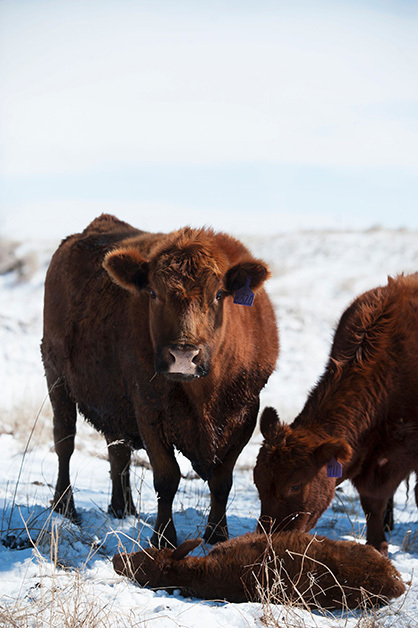 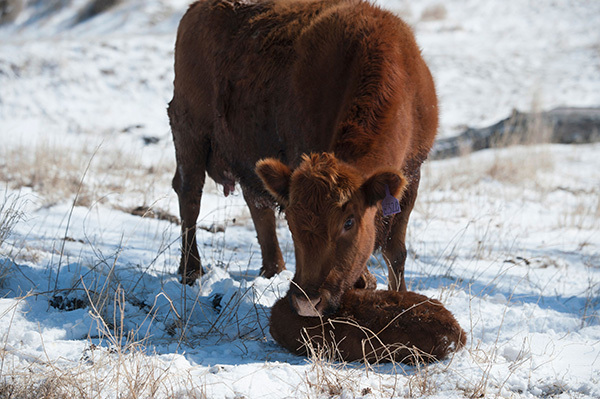 “The calves were previously between where the rising Cheyenne River and Mule Creek converge,” Savanna says. 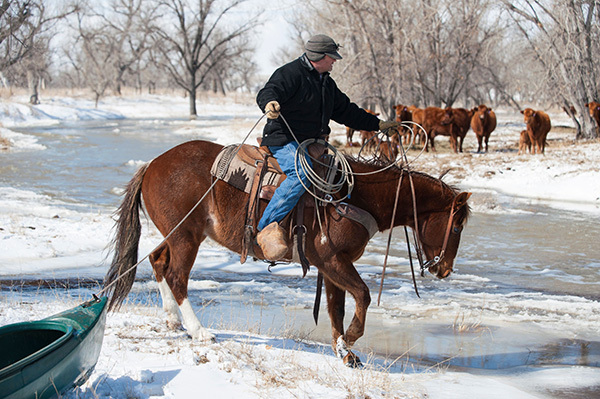 “While a few of the calves crossed Mule Creek of their own accord, many were spared frigid water temperatures by the Kottwitz’s efforts. 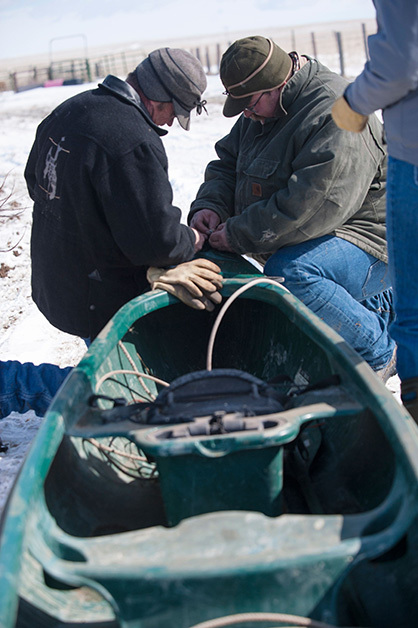 The entire process took several hours. 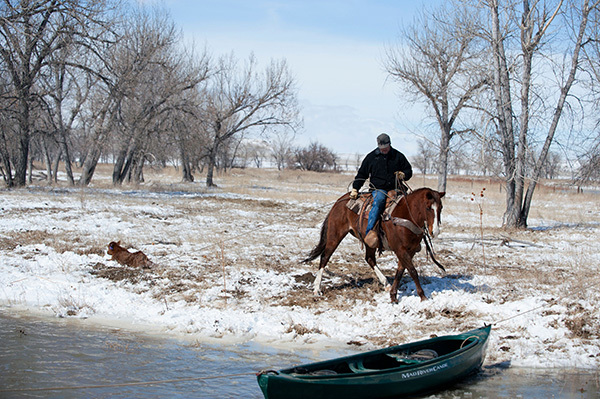 Although the wind was blowing hard, the temperature was around 30 degrees, which is warm for Wyoming during this time of the year. 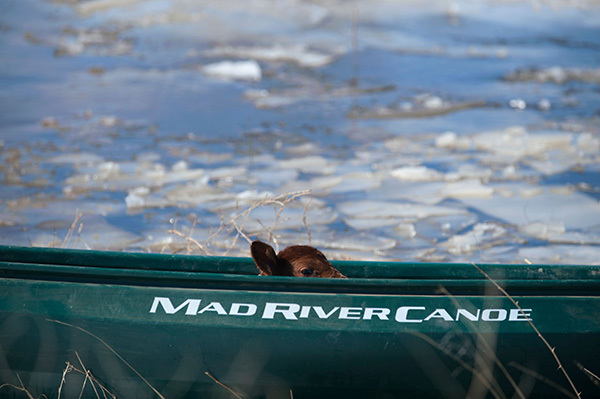 Scroll below for more great photos, courtesy of Savanna Simmons. 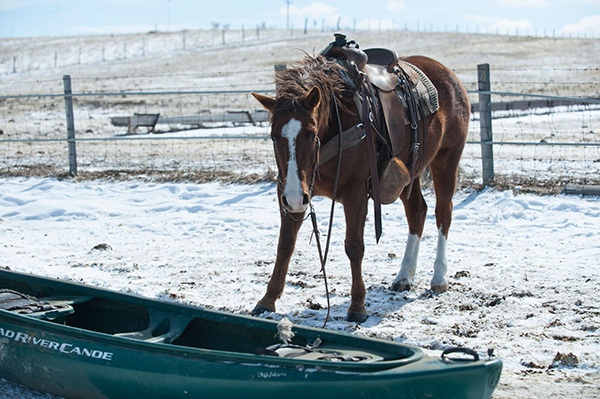 If you have a great idea for a story, email B.Bevis@EquineChronicle.com and you might see it featured on EquineChronicle.com.